Still marking exams. It’s crunch time now though since I only have until Wednesday to finish. I’ve only got about 85 grade 11 exams left to mark. It’s slow going though, I mark at a rate of about 7 per hour. 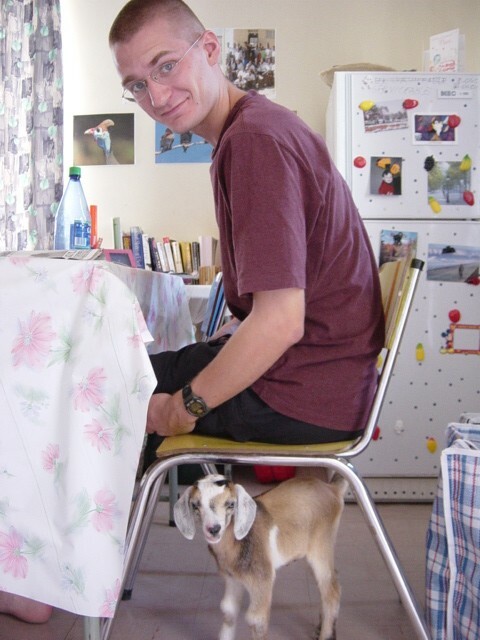 For the Easter weekend, we had both Friday and Monday off (and all of Namibia shut down, so we couldn’t send an email last week), so we went to visit one of our friends who lives in Tsandi, a town northwest of us. It was somewhat of an Omege reunion, since all seven of us who stayed in Omege during our training were there, plus a few other people, and a 2-week old baby goat. 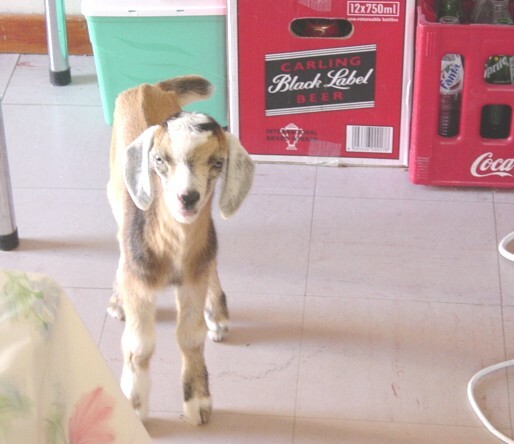 The goat apparently lost it’s mommy and now thinks that Kelly is it’s mother. Some people even took it way out into the bush, and it found it’s way back to her house. 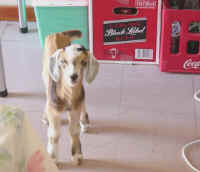 But Jacque ended up adopting the goat, since she lives on a homestead, which is a more appropriate place for a goat. Hopefully she won’t have to eat it someday. 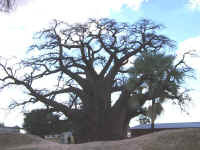 We also went to visit the “tree of life” at Ombalantu. 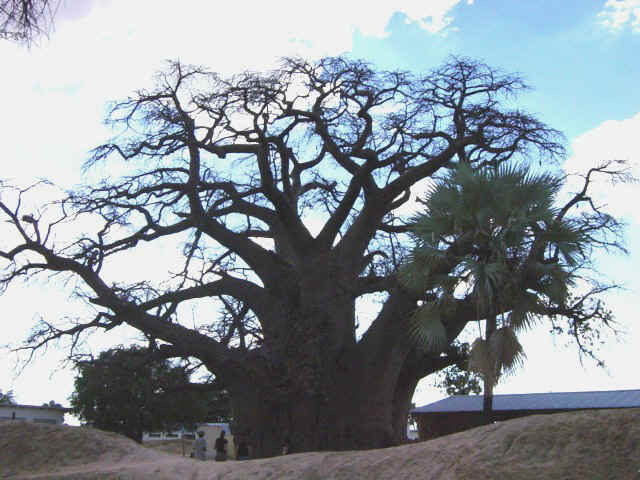 It is a large baobab tree that you can go inside. It has been used for a chapel, cattle shelter, coffee shop, and many other things. Currently it just attracts pseudo-tourists like ourselves. 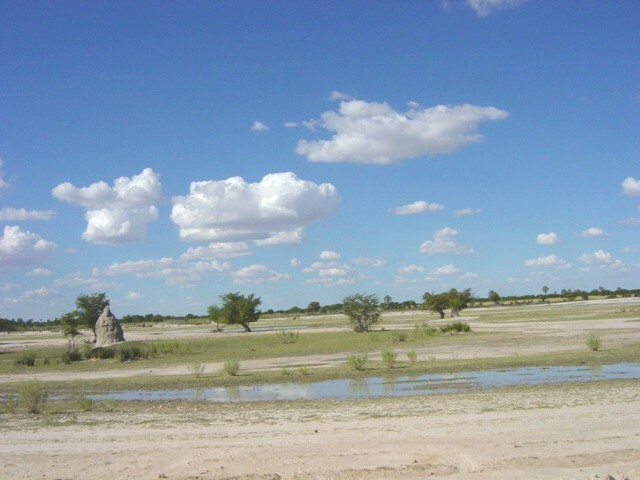 Nearby is an old fort that was used by the South African Defense Force when Namibia was still colonized by apartheid South Africa. All in all, it was a great weekend, just spent visiting. We even squeezed in a few Euchre games, despite the protests of the anti-Euchre faction. For my birthday, Zac managed to make me a cheesecake from yoghurt and condensed milk. He even made a pie crust. Then he made a chocolate cake as a back-up, in case the cheesecake didn’t work. Both turned out wonderful, so I’ve decided I can survive 20 more months in Namibia after all, now that I can have cheesecake. We were planning on hiking through Fish River Canyon for our holiday, but when we called to make reservations, they said the trail is closed because there’s no water in the river. So now we’re thinking of doing a hike at the Waterburg Plateau, which is here in the north. 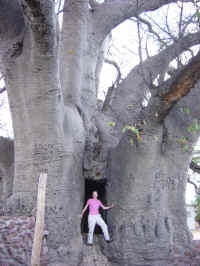 It is a four day hike, but only 42km, which is half the distance of Fish River Canyon. There are supposedly rhinos there, so we might get trampled by a rhino after all. I’m sending you a lot of photos which include never-before-seen footage of Zac and me. We’re including pictures of ourselves so that you can see that we are still alive and also so you will remember what we looked like before we were mauled by wild rhinos. Everything over here in Namibia is still going well with us. The term is just about over now and I have given an exam to all of my students. I gave a fairly difficult exam and they didn’t do so well. The problem though is that all of the questions I gave them were exactly like the questions they are likely to get on their real test (at the end of grade 12, set by Cambridge) so it would be quite a disservice to make the problems any easier. I guess I will just have to help them to be better at math! Now at the end of the term I can look back and reflect on how to be more effective. I was thrown into this teaching thing rather abruptly and I learned a lot. I finished the first term of teaching by sheer brute force, writing lesson plans the night before, teaching the topics that were my strongest, etc. I made many mistakes and I hope to be a much better teacher next term. In the beginning I had no idea what kind of students I was up against. When writing up lessons I didn’t have any kind of feel for how much material I could cover, how much the learners already knew, what strengths and weaknesses they had, or the kind to problems I could face when trying to explain certain things. I certainly learned agony as a teacher when the learners cornered me on a few occasions over the finer points of a topic. That really bites when I realize I don’t know for sure an answer or it takes me a little too long to come up with a reply. The worst part is that the answer is right there in the book on my desk or on the paper in my hand but as the teacher I should know it solid and not even loose eye contact. I have never before been too concerned about the long-term maintenance of specific mathematical formulas and details, resigning instead to know the broader trends and ideas. I was not, and don’t think I should have been, ashamed to have been content with knowing that I could just look something up if I needed to know it. But as a teacher, in front of a class, or otherwise with students, this just doesn’t fly. This next term I am going to use my new experience and do a much better job of planning, both with individual lessons and with what I cover during weeks and months. Also, the learners just need more practice so I am going to give a lot more homework and quizzes. So hopefully next time I give an end of term exam they will do much better. Since the exams began I have had a lot of free time so I have been doing quite a bit of reading lately. I actually have a big stack of papers to grade also but they don’t take as long as English tests so I have vouchsafed long hours of my time lately for reading. Now that I don’t have TV, movies, or video games to distract any of my time books have taken over completely. The learners also come and peruse through our small collection. We have two learners reading Tom Clancy right now. I think they like the action and worldly settings, though I don’t know if such books aren’t just confounding their already distorted view of places and things outside of Owamboland. Also, for some reason, one of my 12 grade learners always signs himself “Comrade” Frans ya Nekongo; so last night we lent him a copy of Animal Farm, which we just got from Sera’s parents. I hope he likes it.